We stared at the new world with trembling. So many times we had come close before, only to discover that they had been there first. The natives were not happy to see us if the Vikings had been there first. “What do you think, Captain,” I asked as we approached the shore. We jumped into the long boat, leaving our ship in the hands of the crew. The soldiers came with us for protection. Many had already been lost as we encountered the natives after the Vikings. We rowed ashore silently hoping to avoid warning anyone who might be there. As we approached, the nerves of each man began showing. Each wondered how he might react this time should they actually encounter any Vikings. Most had barely escaped in previous meetings. We landed warily and looked around. Off in the distance we saw what might be a native village. It was untouched. We relaxed as we jumped off the boat and headed towards shore. Perhaps this time we might be able to establish friendly relations with the natives. We approached the village with more freedom than other places we had come. Natives stared at us as we walked past. Soon we met the chief and through signs and acting we were able to communicate our good intentions. It was time to head back to the ship to get our gifts. As we turned we looked towards the boat. Flames and smoke billowed from the boat. They had attacked. This was going to be a lot more difficult than we had thought. Abi turned back to his desk. While his boss was following the law; he had gone so far as to allow Abi to come in and clean out his desk. Some of his friends hadn’t been so lucky. They showed up at work today only to find out that their key cards weren’t working. He and his friends had been texting, wildly sharing their trials that they were enduring only hours after the edict had been published. Abi looked up as James walked in. He tried to smile. James was one of the good guys. The Africans and the Vikings had always worked well together and Abi, with what loyalty remained for the company and the country, was glad that James would be his replacement. He shuddered to think about what would happen with those companies that turned solely to the English for replacements. “I’m so sorry, Abi,” James stuttered looking at his long time friend. 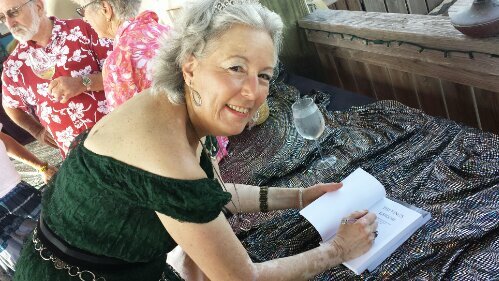 Devorah Fox signs my copy of The King’s Ransom at the release party. The party was at LaBaratria Restaurant in Port Aransas. There was an amazing layout of food and drink to celebrate book 2 of The Bewildering Adventures of King Bewilliam. We had a great time! I have to admit that I am not a fan of Fan Fiction. Many people enjoy writing it. Others enjoy reading it. Still more prefer to both write and read it. My personality doesn’t fit with the idea of Fan Fiction: I want to be the creator of the character. I want to develop that character and give it life. Given how much of my writing is published at this point, I had never thought of Fan Fiction from the author’s viewpoint. A local writing friend who recently published her second book, Devorah Fox, has written a good article about the subject. She calls it the sincerest form of flattery. What are some of the things she says? The article is a good read, so check it out! So, after all the votes were counted, it was a tie. We are having a runoff. Check out the stories again and vote again..or for the first time. I would appreciate your support, especially if you think mine really should win! Vote at Write on Wendy for the tiebreaker. Thanks! There is a contest known as ‪#‎5MinuteFiction‬ held every Tuesday night. You write a story in 5 minutes…well…15 minutes from prompt appearance to close of contest. First of all I want to make you aware of it and second of all, I’d like to invite y’all to read the finalists and vote. My entry is one of the top 5 – apparently there were only 5 entries? Anyway, please head over to the #5MinuteFiction finalist page Read the entries and vote on the one you think is the best. (I’ll never know who you vote for so you can vote for the one you like the most.) You have until 7:30 PM Central time Wednesday to vote. THEN….prepare to enter yourself next week on Tuesday night at 7:30 PM Central time. Diane O’Key was the judge for the evening and Wendy Strain is the host of this fun contest. The prompt was that you had to include Vikings in the story. 2) Give me the URL where you shared the post in a comment below. 4) Winner will be announced in this location. Laura is seeking to find herself. A bout of injury induced amnesia has left Laura clueless about everything but her first name. Stuck in an old house in the middle of a blizzard, she looks around the house trying to find anything she can about herself. When she gets to the basement she discovers a room below the basement. As she walks into the room an unknown force transports her to a warm summer day in the middle of a pasture. She is discovered by a young boy who, with his sister, has wandered farther than he should have while exploring. As Laura enters what appears to be a quaint medieval village she begins a journey that moves from trying to discover her own identity to unlocking the mysteries of the village. She is taken in by the village’s benevolent leader, only to find that many do not see him as benevolent as the rumors start flying about him. The rumor mill appears to be an attempt to replace him. The villagers talk in glowing terms of their deity, but underneath their praise is a strong measure of fear. What happened to the village leader’s boy who disappeared years ago? What happened to his daughter who disappears at the festival in honor of the village deity? As Laura seeks to unlock those mysteries, and prove that the village leader didn’t murder his missing daughter she also has the seemingly impossible task of finding her way back home. 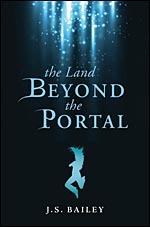 As the book concludes, all of the loose ends are tied together as Laura and the other time travelers lead their friends to discover the truth behind the village deity, the ugly rumors about the village leader and how people are traveling in time. They also discover the location where the daughter had been spirited away, uncover the mystery of the missing son and ultimately who Laura really is. Bailey sets an amazing web of confusion in this book that ultimately resolves satisfactorily in the end. One of the best messages that I got from this book is the reminder that God is present wherever and whenever you might be. Another time traveler reminds Laura of her love of the true God and under the power of prayer they embark together on some dangerous journeys seeking to solve the mysteries. Some of the people whom Laura thought she could trust turned out to be involved with the evil influence in the land and others turn out to be quite different and more helpful than they first appear. I really enjoyed reading this book. It has good characterization and the descriptions of the valley where the village is located make you feel like you are actually there. Even more than that though is a story line that draws you in and makes you wonder what will happen next. Once I started reading, I didn’t want to stop reading until I was finished. If you’re looking for a fun read that touches on suspense, hints at the paranormal and even includes science fiction, this is a book you will love.